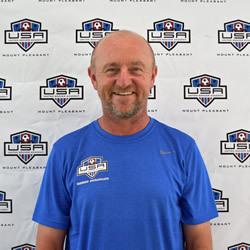 Coaching Education: NSCAA - Director of Coaching Diploma, Advanced National, Regional and State Goal keeping Diploma, National Youth Certificate. USSF -"B" license, USYSA - National Youth License, English FA - Psychology and Fitness Level 1. Coaching Experience: 21 years of youth coaching has allowed me to coach hundreds of players on a variety of successful teams. Club Accomplishments: April Heindrich/Nike Scholarship Award (recognition for contribution to Women’s soccer), 16 State Finals (11 winners), Regional champion, Finalist and bronze medal. Multiple tournament winners. Favorite Club: Leeds United and Chelsea FC. Favorite USAMP Coaching Moment: Anytime a player thanks me after our training or a game.